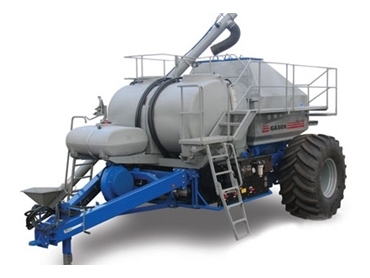 Both the 2120 and 2150 models of liquid air seeders from Gason feature a 5000 litre UV stabilised polyethylene tank along with middle and rear steel bins for use with granular products. This feature allows for the application of liquid and solid fertilisers with seed. The liquid air seeders dual pump system offers a high degree of mixing via four in-tank agitation models. The optional second meter control system can control two incompatible liquids from the main tank which are distributed through the ground. All liquid air seeders have a 500 litre fresh water flush tank. Optional extras include a 500 litre trace element tank and variable rate injection pump.